List card can have a bar flavour in which data is represented as a bar chart in one row, supported in both extended and condensed list cards. OVP table card represents the data in tabular format. OVP table card presents 3 fields, the data in the three columns are filled according to the importance and the order in which they are specified in the annotation file. this is mapped to action defined in OData model like function imports. I will discuss more of it when I’ll be explaining stack or Quickview card. this is used for intent base navigation actions. In simple words, intent-based navigation between two Fiori application hosted within the same Fiori launch pad using semantic object and semantic action of the Fiori application. I will discuss more about intent based navigation when I discuss navigation in forthcoming blog. This is used for URL based navigation to an external application. I will discuss more about intent based navigation when I discuss navigation in forthcoming blog. In simple words, SelectionVariant annotation is used to filter the data. Also used to support requests to a parameterized entity set with input parameters.These filters and parameters are also considered while retrieving the KPI value for the Header section. I’ll discuss more about KPI values when I’m discussion header card section in next blog. PresentationVariant provides information about the sorting criteria applied on the entity set. Used to provide the KPI title, formatting options including number formatting, criticality (colour) and the trend in the card header section. I’ll discuss more about KPI values when I’m discussion header card section in next blog. Table and list card use the com.sap.vocabularies.UI.v1.LineItem annotation, to display values. 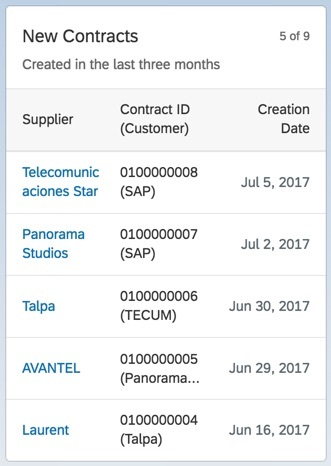 you can use different com.sap.vocabularies.UI.v1.LineItem annotation for different cards instances of the same entity type by using different qualifiers, and setting the annotationPath property with the qualifier in the card configuration. for example com.sap.vocabularies.UI.v1.LineItem#Qualifier1 and com.sap.vocabularies.UI.v1.LineItem#Qualifier2. At run time, the line item records are sorted according to importance, set in the com.sap.vocabularies.UI.v1.ImportanceType annotation, and their order of entry, and each card uses different number of fields according this order. 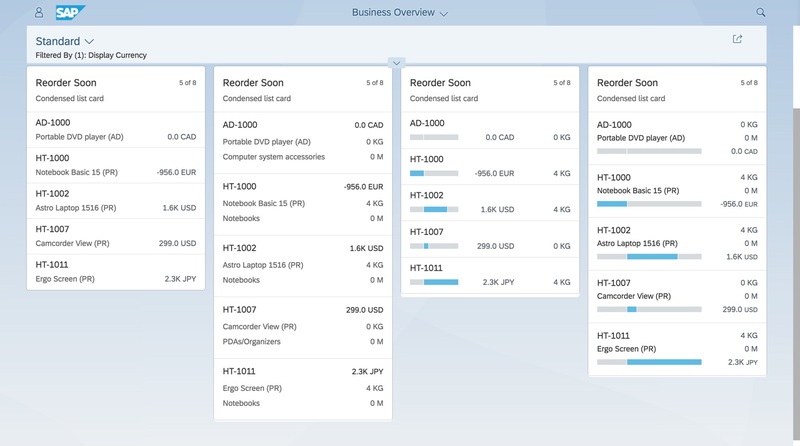 The cards search for com.sap.vocabularies.UI.v1.DataFields and for com.sap.vocabularies.UI.v1.DataFieldForAnnotation that points to a com.sap.vocabularies.UI.v1.DataPoint. "template": "sap.ovp.cards.list", // type of card i.e. list in this example. annotationPath: as explained above, list and table cards use LineItem annotation to display values, annotaionPath setting of the list of table card need the path to this annotation. In this case, LineItem annotation without any qualifier will be selected. You can also specify qualifier like LineItem#ReorderSoon, in this case, LineItem annotation with the qualifier ReorderSoon will be considered. addODataSelect: We only need attributes which are specified in the LineItem annotation to display any card. But if this property is false and no SelectionVariant annotation is specified. Then no $select query will be added to the data call. Hence this setting is quite important from the performance perspective. sortOrder and sortBy should be used in case of a simple sort condition. For complex sort scenarios, a PresentationVariant annotation can be used. Properties like the label inDataField and title in DataPoint is not valid for list card but in table car,d they will appear as the column header in list card. 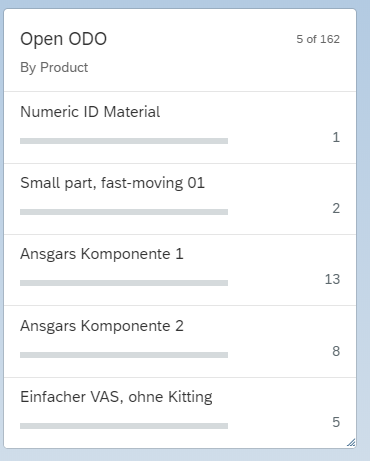 I want you to create 3 more list cards just by changing listType and listTable and analyse which dataFileds and dataPoints are getting displayed in which type of list card. You should get the result like in the picture above with 4 list cards. The settings for the table card is almost the same as list card only the card template should be “table” instead of “list”. You might have noticed that I have not specified annotaionPath in card setting but its still rendering the values because it’s taking the value of default Identification annotation without any qualifier. We have successfully understood the behaviour of list and table card, some general annotation used in OVP and annotations used by table and list cards. We have also created 4 list card each of different type and flavour and 1 table card. In the next blog, I will discuss more card header like view switch, KPI etc, annotations used in card header. stay connected !! thanks for explaning the OVP card of List/table type, here is a question to standard-list with bar flavour, so you mentioned that it would show the first DataPoint value in a bar, I have tried it it works but without color, even though the datapoint has different value, however the bar looks the same and without any color just as in your sample pic. Do you know how to deal with that? This issue may occur because of different reasons. Please check if the property associated with bar is having data.